The injury bug has hit the Union’s back line. 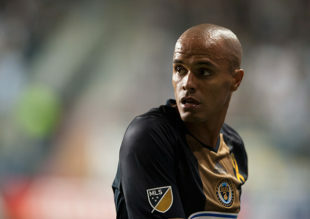 Union starting left back Fabinho was forced off at halftime during the club’s last match against Columbus Crew. The decision now has to be made as to whether it’s best to strengthen the muscle around the injury or opt for surgery. It forces the Union to answer another difficult question: Is it now Matthew Real’s time to shine? While they aren’t scheduled to return until March 28, Curtin explained both could potentially be called back earlier. If Real is to return, it gives Curtin two choices to start at left back in Colorado. Raymon Gaddis was chosen to replace Fabinho when the Brazilian went down, but Gaddis’ natural position is right back. Real was not among the available substitutes, so it doesn’t provide clarity as to whom Curtin prefers. It should be noted Gaddis’ best season came on the left side during the 2014 campaign, so he is capable of playing the position in a pinch. So Gaddis is the reliable veteran and a more defensively responsible choice. But as seen in the second half against the Crew, he’s reluctant to join the attack. It left winger David Accam too isolated on the flank. Real is the antithesis— a green teenager who likes to push forward but sometimes at the expense of defensive positioning. Because of the Union’s organizational structure, though, Real was seasoned at Bethlehem Steel in 2017. There, the Brazilian-American from Drexel Hill, Pa. played over 1,600 minutes in 18 starts with one goal and one assist. Considering all factors, you’d think Curtin would lean toward the safer choice. Does Curtin really want an 18-year-old making his debut on the road after missing time leading up to the match? Would he trust a back line with two teenagers on the left and and overall average age of 20.75? Curtin, however, downplayed those factors. “It’s a hard spot, but there’s no easy spot,” said Curtin with a smile slowing creeping onto his face. He then mentioned the success of fellow first-year homegrowns Auston Trusty and Anthony Fontana. It’s those two players who may give Curtin the belief that Real can succeed, too. The coach also mentioned Fabinho wasn’t the only injury on defense. Center back Richie Marquez underwent surgery for a sports hernia and is expected to miss four to six weeks. Curtin praised Marquez for gutting it out last week to give the team depth on the bench. That depth will now be tested. It looks like McKenzie and Joshua Yaro will be competing for that bench spot behind first choice center backs Trusty and Jack Elliott. We all screamed “Play the kids!” Welp…here ya go. I’m not complaining, just saying that the trials by fire about to kick into high gear. I hope you are right. If this is truly the way they are going it makes things so much better. When some some of the kids fail I’m ok with that. Because it’s going to happen. But that’s ok. This just needs to happen from a philosophy perspective. If we’re going to lose, I’d much rather lose while developing a player for the future. Depending on how things evolve, we might need to give serious consideration to putting Derrick Jones into the lineup as destroyer to give the defense some cover. Ale can play the right wing. I’m really ok with the youth. If the kids get the minutes,so be it. It could be the start of some great play for the Union. It could be awful. But it is more fun than we have had in a few years! And more interesting! Some young lungs a mile high against a bad CO team – seems like the perfect time to start him. Real looked good in preseason! I’m fine with letting him play back there. If for some reason Curtin doesn’t play Matt, Gaddis will do just fine. He’s probably better at left than he is at right anyway. If anything it would allow Rosenberry to get even more involved in the attack with Gaddis’ added defensive cover in the back (assuming Curtin can do ‘tactics’). i wouldn’t be surprised if they go gaddis in colorado and then start real the next game. Remember that Curtin in a press conference is conscious he is talking to his next opponent. He could recall Real, but what does that do to his relationship with the USYNT. and Tab Ramos? Warren Creavalle played flank back, badly, earlier in his career, never since he’s been under Earnie Stewart. last point. Trusty had 46 games with the Steel prior to his promotion to the Union. Real has had slightly more than a third of that. McKenzie was not comfortable at flank back in a one game runout in 2016 at Lehigh. The only reason Gaddis should have any possibility of starting next game is if they think keeping Real with the national team is better. Otherwise play the kids!